I had been wanting to try Marea for at least a year, but when my friend was in town and arranging a dinner there, I couldn't make it because of a gym class. Call me crazy. Not sure what I was thinking. Anyway, I decided it would be a great way to spend Christmas eve lunch here with my bf last week, and it was definitely a memorable dining experience. This Michael White restaurant translates to "tide" from the Italian word "Marea", and offers a variety of Italian seafood choices. At the end of the meal we both agreed we must come back and try more dishes. From Sunday through Friday, Marea offers a prix fixe Business Lunch of $45 for two courses. 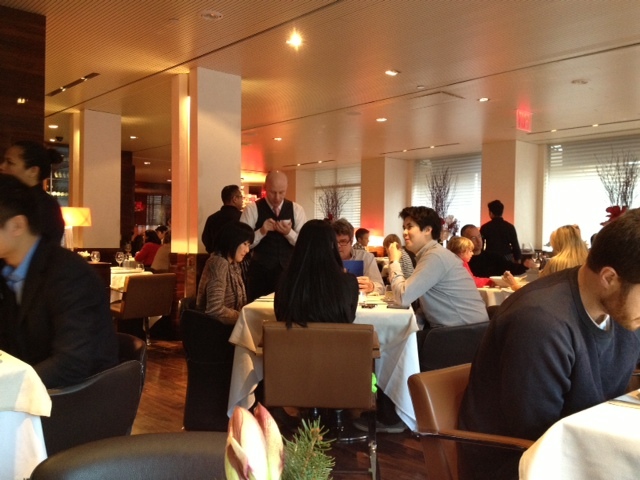 The large dining room is surrounded by windows on two sides, 59th Street and Columbus Circle. 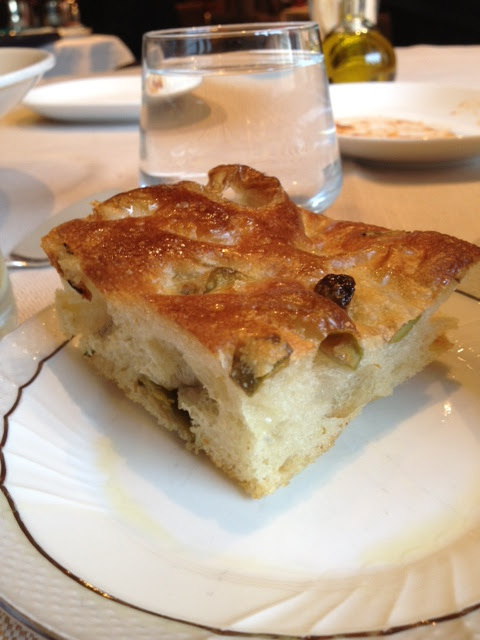 The most amazing green olive-filled focaccia bread. For appetizers we knew we wanted the astice, but had a difficult time choosing between the grilled octopus and the peekytoe crab. Our server recommended the octopus, as it is one of the menu items that has not changed since the restaurant first opened. Astice: nova scotia lobster, burrata, eggplant al funghetto, basil ($8 supplement): The combination of the seafood with the sides was incredible. The freshness of the lobster was undeniable, and the appetizer really stood out as both decadent and flavorful. Polipo: Grilled octopus, smoked potatoes, pickled red onion, radish, chilies, tonnato: Without a doubt this is the most tender grilled octopus I have ever tried. I absolutely loved it, and the accompaniments of potatoes and red onion were just as delightful. I did find however, that there was so much flavor, the sauces were not necessary, and if anything made the dish slightly too salty. Fusilli: durum wheat pasta, red wine braised octopus, bone marrow: An al dente pasta cooked with more of the amazingly tender octopus. The pasta sauce is intensely flavorful, and the garlic toasted bread crumbs offer a pleasing textural contrast. Spaghetti: fresh cut semolina pasta, crab, santa barbara sea urchin, basil: I doubted this could be as wonderful as Basta Pasta's sea urchin pasta, but I was surprised to find it to be an even more luxurious version of Basta Pasta's. There were clumps of crab meat with blended sea urchin amid the spaghetti bathed in a sweet tomato sauce, and finally topped with garlic bread crumbs. Complimentary sweets: (clockwise from the red): blood orange passion fruit jelly, dark chocolate, cream puff, chocolate hazelnut. I'd be happy if anyone takes me on a date to this wonderful place. It looks grandiose yet it has a casual ambiance. The food looks amazing, too!